I’ve often tried to think what makes certain people tick while others struggle to get even basic professional standing or success. I think a lens to look at various folks is in terms of ‘Skills and Street Smarts’. Skills can be further divided into two types (Shallow & Deep) and by Street Smarts, I mean the basic sense/temperament of business, people handling, ability to optimise money decisions and leverage ‘arbitrage opportunities’. There’s another dimension relevant to this discussion, that dimension is of ‘Opportunities’. Opportunities are those super forces that can help one in changing their life/career trajectory. Needless to say, one has to latch on to the right opportunities and you’ll find for most successful people (in business or elsewhere) that they found great opportunities somewhere in their journey and capitalised well on them. In contrast with Opportunities, Skills are something which are much more in people’s control. One can decide which skills to develop and how deep to go in them. Street Smarts, I believe is a way of dealing with day-to-day life situations and people and becomes a part of ones nature during their teens or early 20’s. In most cases, people continue to operate within their circle of street-smartness with small changes for remainder of their lives. 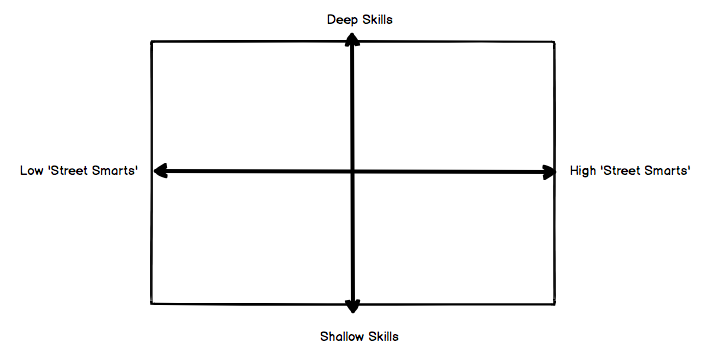 Empirically speaking, I think people who struggle to scrap by in life (not able to settle professionally, earn a reasonable salary etc) are more often than not in the ‘Shallow Skills’ and ‘Low Street Smarts’ quadrant. 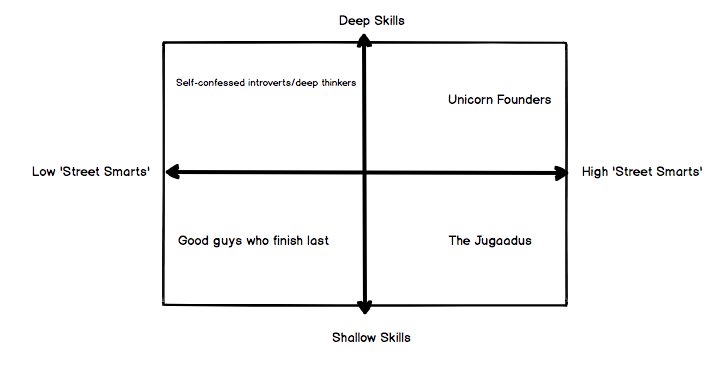 Highly successful entrepreneurs (with massive outcomes/impact) tend to lie in ‘Deep Skills’ and ‘High Street Smart’s quadrant. Your neighbourhood slacker (Jugaadu as we call them sometimes), the one who doesn’t really have any professionally important skill but knows enough people and/or has enough business sense to find small arbitrage or similar opportunities to make a reasonable living. With different combinations of Deep/Shallow Skills and Street Smarts, various outcomes happen. The folks who concern me the most, the ones who are not able to stand on their feet and get about growing in their lives invariably happen in the ‘Shallow Skills’ and ‘Low Street Smarts’ quadrant. An easy way for them to come out of that quicksand is to pick up some skills and if possible team up with someone who has more street smarts than them (and can be trusted with). Also, I believe a good majority lies in the low deep skills and low-to-mid ‘Street Smarts’ range. While, the prevalent tendency is to optimise for becoming more street smart (penny negotiations etc) I believe most people would be much better off if they instead try to optimise for going deep in their skills of choice. This entry was posted in people, psychology and tagged career, life-skills, opportunities, skills, street smarts, success on October 12, 2018 by mayank.